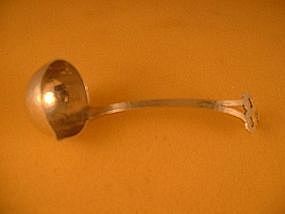 Sauce ladle by Marshall Field & Co. Hammered finish; Gothic pattern. Length 5-3/8". Weight 1 troy ounce. The monogram is a script C. Marked M.F.&.CO Gothic STERLING 300-4. Mark and overall condition are excellent.